Samsung Galaxy S3 for UK getting Premium Suite Update. The Software update can be download now. User can update the device using KIES or by OTA. To update using KIES, see here. The update brings in quite a few software features from the Galaxy Note II, most notably the Multi Window option to split the display in two and have a pair of apps running simultaneously. It also updates the camera with stacks of new features, including an updated ‘Best Face’ group shot management tool, a “low light mode” for better gloomy performance and a wider panoramic option. You can see the Premium Suite update video here. 20th December, 2012, London, UK — Samsung Electronics Co. Ltd., today announced a Premium Suite upgrade for its flagship smartphone the Galaxy S3, further improving the experience with innovative and even more convenient features. Samsung is committed to providing customers with the best mobile experience by continuously offering an operating system upgrade for its devices. As part of this effort, Samsung has recently provided the Jelly Bean 4.1 upgrade for the Galaxy S3, and will bring even more enhanced features to the phone through the upcoming Premium Suite upgrade. Consumers around the world have already enjoyed the elegant intelligence that the Galaxy S3 brings to their lives and the Premium Suite package takes this to a higher level. Group Cast: With Group Cast on the Galaxy S3 and a Wi-Fi network, share and collaborate on documents, presentations or images in real-time with multiple friends or colleagues without loading the file separately. This is now a stand-alone app, rather than part of Allshare Play, making it is easier to access. Auto Share Shot Pairing using NFC: By setting the camera to ‘Auto Share Shot’ mode, quickly share photos and videos by simply tapping the Galaxy S3 with other NFC and S-Beam enabled devices. Other advanced and convenient features on the Galaxy S3. 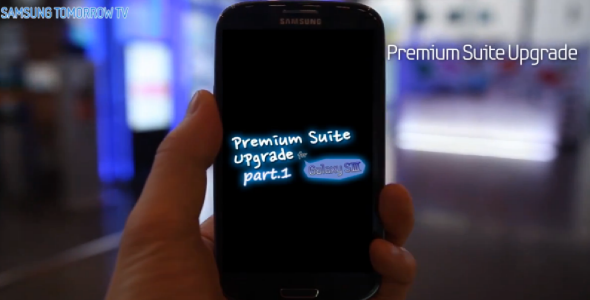 The UK roll out of the Galaxy S3 Premium Suite upgrade begins today. Android, Google, Android Beam, Google Search, Google Maps, Gmail, Google Latitude, Google Play Store, Google Play Books, Google Play Movies, Google Plus, YouTube, Google Talk, Google Places, Google Navigation, Google Downloads are trademarks of Google Inc.